I’m here again, blogging in the family room again, about curtains again. Thank you all for the sweet compliments you left last week about my newly painted pale blue family room and warm white window treatments. And it was also nice to hear from some of you that I’m not the only one that has a hard time when it comes to dressing windows. There may be 50 shades of grey, but I’m fairly certain there are a zillion shades of white. And here in this old cottage the ivories, creams, and whites are having a hard time playing together, when it comes to curtains that is. I’m trying not to let these silly little window panels get the best of me. So I still love the blue walls, and I still love the stained wood window hardware and rings. I also still love the panels I so proudly blogged about just one tiny post back. But something still just wasn’t right to me and I couldn’t figure out what it was. Why am I still thinking about these curtains every second of every day? So I tried out a few of the panels from the other windows in our cottage here on the back sliding door. And with all the excitement going on my sweet family of decorators also started to offer helpful suggestions. My son pointed out that I have ivory lace on many of the windows downstairs. Could it really be that simple? My favorite window treatments downstairs are the vintage lace panels in our living room. Could I simply just bring in more lace? 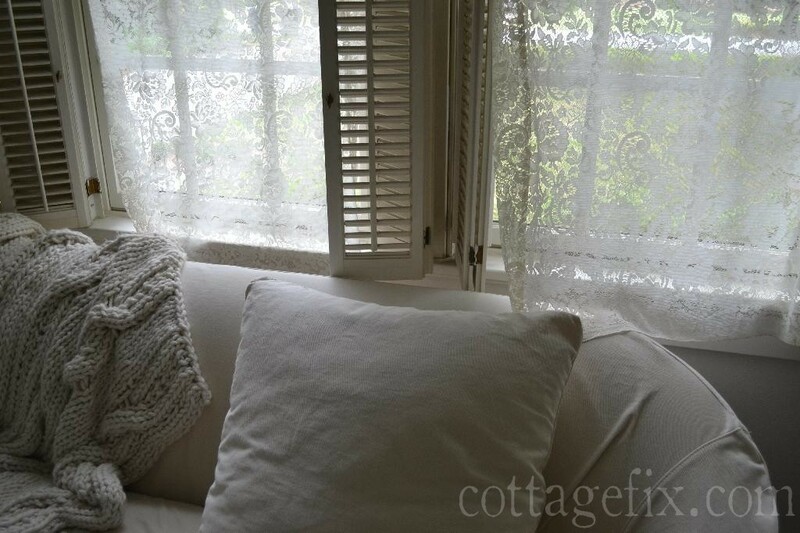 Meanwhile I keep reminding myself that I HAVE successfully chosen and hung window treatments in most of this little cottage of ours. And I still am happy with them years later. In the office, the windows are wearing lace valances on the top and wooden shutters on the bottom. 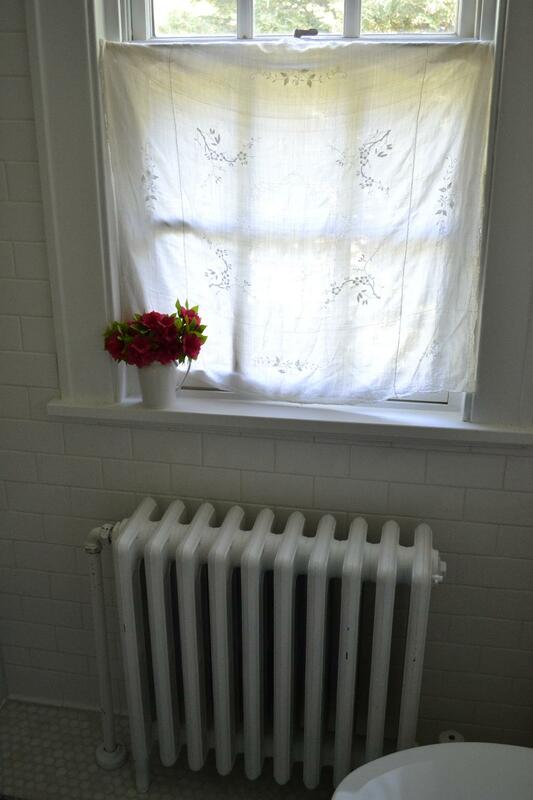 In our upstairs bathroom I used this vintage tablecloth to make a sweet little café curtain. 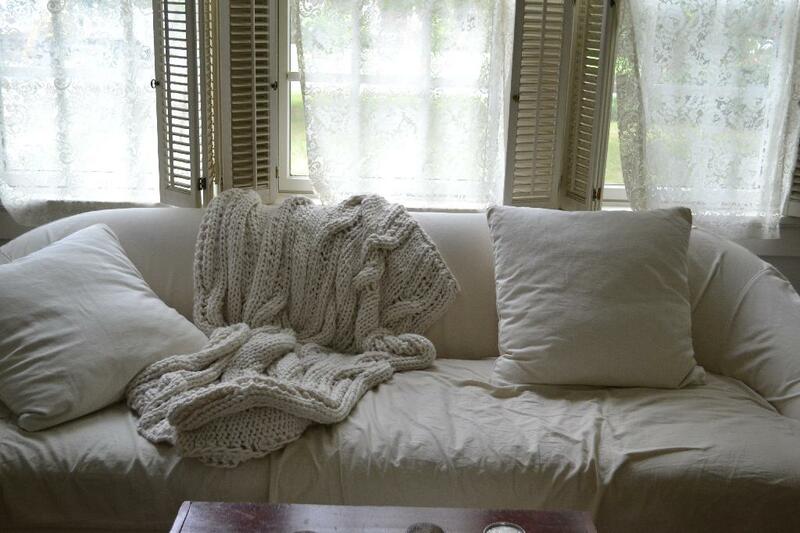 And in the kitchen, white Shabby Chic sheers lightly soften the windows. So I went with more lace panels in the family room along with toile panels on each end. These toile panels have been in here before and I really think they help tie in the floral chair and ottoman with the rest of the room. At one point I was considering new chairs in here, but I like the furniture in here to be comfortable for the kids to eat and drink on with no worries. The chairs in here are both secondhand and fairly indestructible (hope I didn’t just jinx myself!). And it’s nice to have one room downstairs with more color. I always seem drawn to color on some of my favorite blogs and in magazines. Then there’s the tiny little problem of not having saved up for new furniture. Yes, I’ll be working with the floral pattern for sure. As soon as I had this curtain situation figured out “in my mind”, a cool sea breeze blew in. The air turned fresh and we were able to pop open the windows for the first time this August. It’s unheard of around here to have the windows open in August so of course I considered this a sign. What else could it be? I also tried the lace panels on the sun porch. If I add them in here, our entire first floor (minus the kitchen) will have lace. It really ties all the rooms together since they all open up to each other. With all this lace on the windows I’ll be sure to go easy on more lace and ruffles in the other accessories I suppose. I don’t want to go too far overboard with frills and lace! ps The humidity is back and the windows went back down almost as fast as they went up. Wonder what that means! 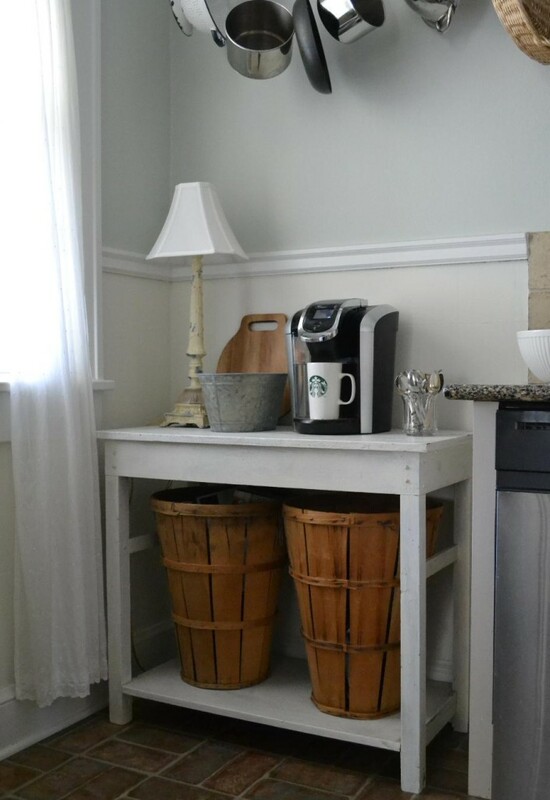 This entry was posted in cottage decor and tagged cottage, curtains, decorating, shabby chic, warm whites on August 12, 2015 by sally. 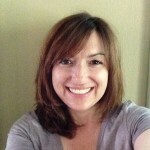 I laughed at your furniture comment! Almost none of my furniture is new, it’s mainly dumpster dived, given to us or stuff I’ve had since the early 90’s and painted white:) Our sofa and coffee table are pretty much the only new stuff we own! 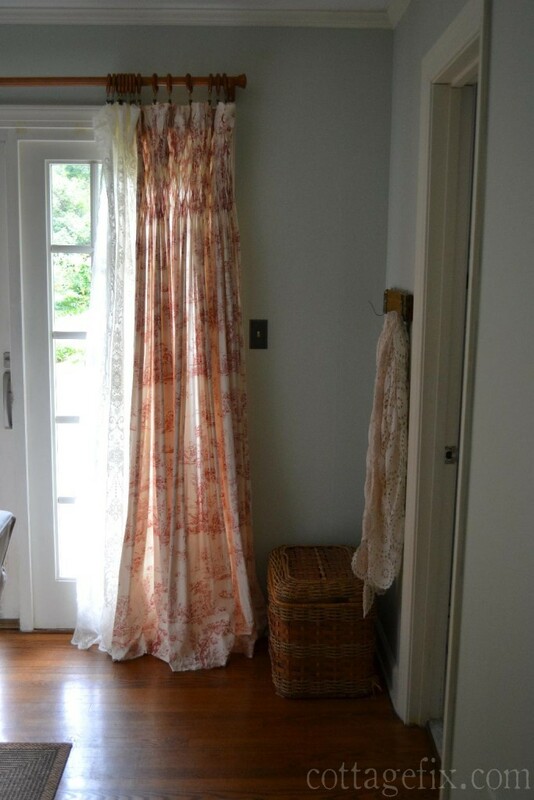 I have to say, the toile panels with the lace curtains is my favorite that you’ve tried in this room…so so pretty!! And I love the peaks into other rooms of your charming cottage you gave us in this post. 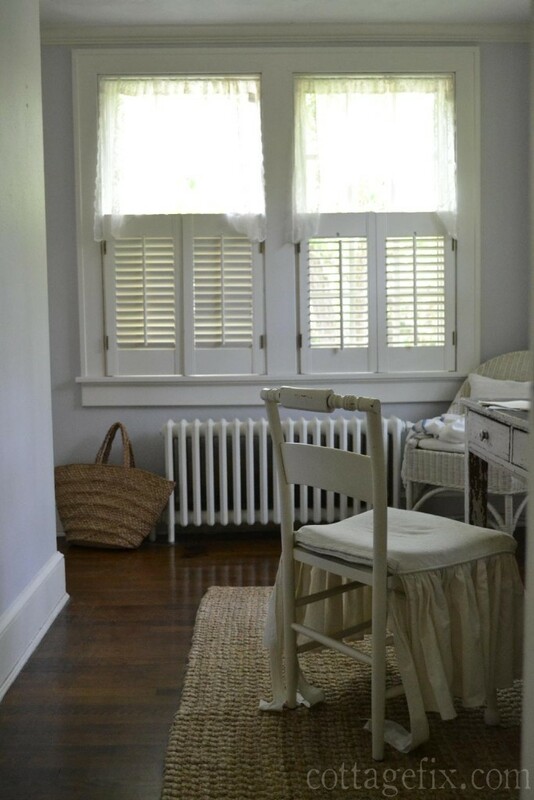 The simplicity of your window treatments is sheer perfection, in my opinion! I tried making a grainsack looking roman shade for our bay window in the kitchen, and it looked awful. Then I stitched up a large ticking roll up shade, which is hanging in the window now, and I’m not liking it either. Did I mention that I ordered a lace valance sample that I didn’t care for? And then I found a lace valance with a windmill in each little section for our Dutch Colonial home that I’m contemplating…. Hmmmm. Do you think there’s a support group for us? I like the lace mixed with the toile in your family room. I think it’s nice to have everything tie in together from one room to the next. 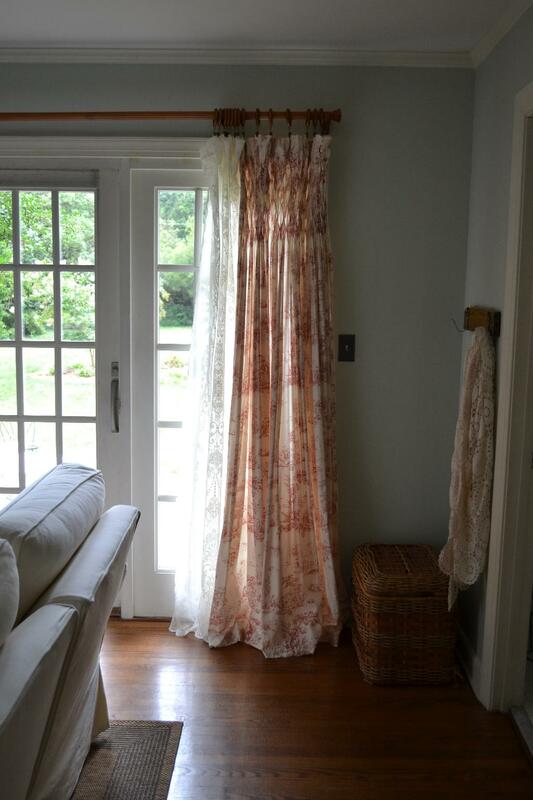 The toile drapes look wonderful with the lace!! It finishes off the windows. I like the look before, and like it even more now. It looks very cozy. I really like the white lace throughout your house so your final decision is beautiful to me. We had custom white wood venetian blinds for years but they are so hard to keep clean. So finally I took them all down and hung white linen curtains that have a raw edge at the bottom (no hem) a bit tattered and perfect for our Nordic Coastal living style. 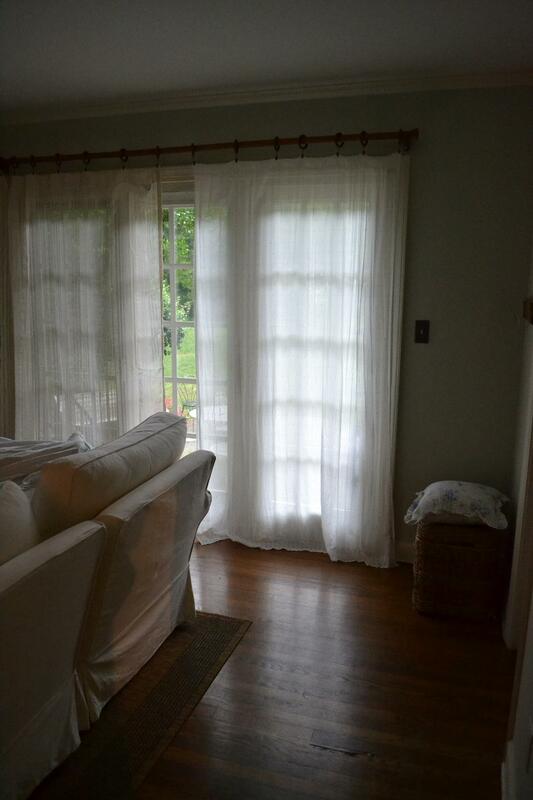 I hung them in every room except my son’s…his are natural linen to go with his industrial/rustic/modern decor. And our french door that leads to the garden has lace. 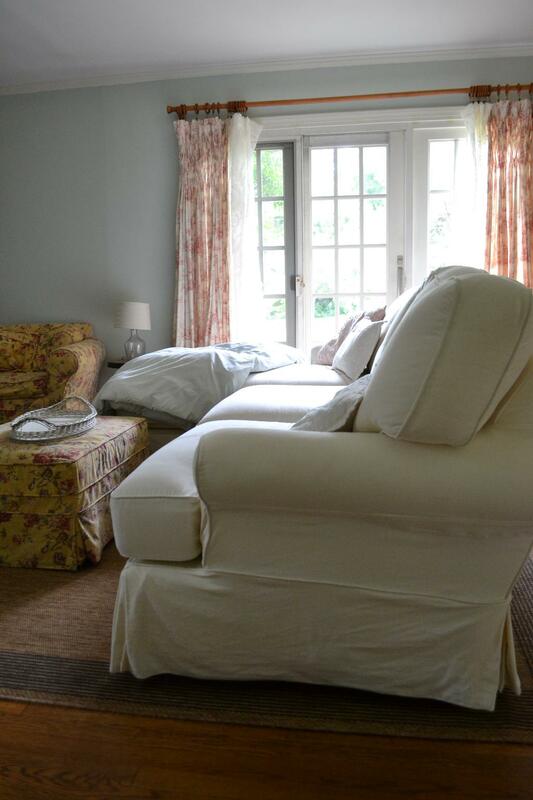 I like the simplicity and calm that light, airy linen or lace curtains provide. Your barely blue walls are so calming too. Love the added colour…I have been trying to add colour to my home, yet it’s so easy to be drawn to plain old tone on tone of neutrals. With your tea stained cranberry French Toile panels added to the lace I feel like I am looking at a page in the Cabbages and Roses online cataloge of English beauty. 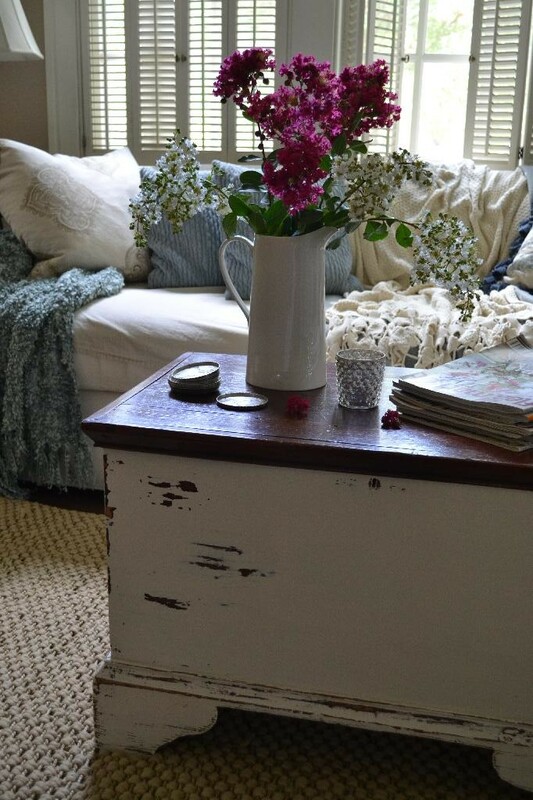 Yet being added to your eccentric farmhouse cottage look it makes for a very romantic mix of european cottage brocante beauty. I like that for some reasons the toile cranberry pulls from the tone of the brick floors anchoring your look. I understand your dilemma and think your choices all look very pretty! 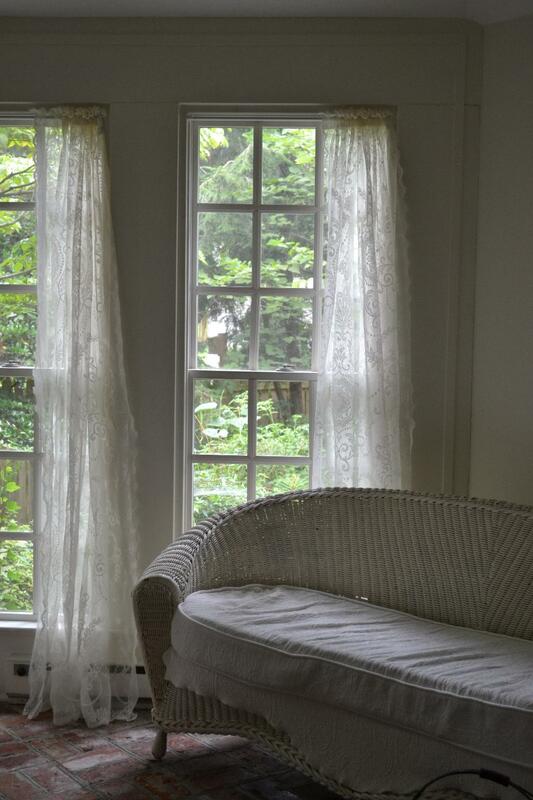 One problem is so many magazines, Pinterest pics, whatever – don’t have window treatments! It is so hard to get ideas. For a cottage style, I don’t want anything heavy, but like you want just a bit of color. Right now I have lace in the living room and dining room. There is a ballon valence at the top of each window – cream with a blue and grey morning glory thing going on – I love the color – it ties in with the blues and creams in the room, but I feel like they are not quite right. Maybe it is because I never see balloon valences anymore, but they cover the hardware for the shades so well. Sigh! Oh, it sounds really pretty! I love balloon valances. I had some shabby chic ones in the kitchen that I just took down during this whole curtain debacle. They looked sweet in the kitchen , but I wanted to let in more natural light. I love the toile panels! Do you mind telling me where you got them? I love the color and the smocking, the are gorgeous. Thanks so much Sally!! I purchased them at a local small business at least ten years ago when they were having a moving sale. They hung in the bedroom of my old house, it only had a single window. I tried to find more online when we moved into this houses a few years ago with no luck. The tag says The Chandler Collection. If you find any I’d love to know! !